Emely is showing you her big hands. Do you like it when women have big hands, when they are able to get a good grip on everything? She is showing you her big hands, stroking them, and then she tries to grab you. 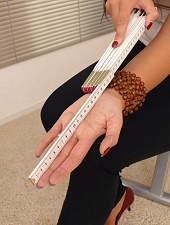 She is measuring the breadth and width of her hands as well, of course. I am sure you will be allowed to kiss her hands for good-bye. Are you ready?